The 2005 British Parks Junior Inter County Knock Out competition was staged on the Milton Hayes and Milton Recs greens on Sunday 31st July. A twelve player squad representing North Staffs Parks pulled off a fantastic achievement in lifting the trophy. This is the first time that North Staffs have managed to get their name on the trophy since the competition started in 1980. In the semi-final they beat Greater Manchester 196 - 146. In a hard fought final, against a strong South Yorkshire team, North Staffs came out on top winning by 16 shots 195 - 179. This was an exceptional all round team effort, coupled with a tremendous fight back by Mark Leadbeater ( 1- 14 down but won 21 - 20) and a resounding single figure victory by Danny Higginson (21 - 9). Full results are shown below. Host Clubs Milton Hayes and Milton Recs for the use of their greens. Measurers, referees, greensmen, County Officials, and all those who helped on the day. Supporters for generating a real "Cup - Final" atmosphere - a real boost to our players. Most of all the Parks Junior County players for their outstanding commitment throughout the season. 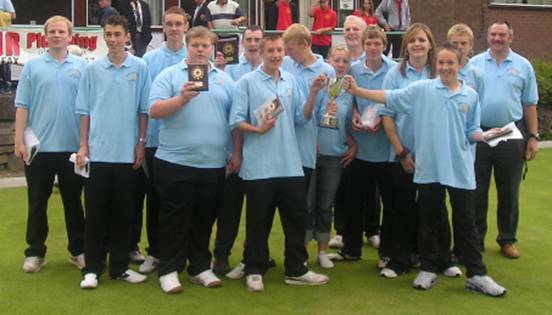 Westlands Bowling Club were well represented in this achievement with 5 of our juniors involved. Congratulations to Marie Brain, Matt Hill, Adam Jackson, Rich Jenkins and Todd Ridge for the part they played in this success (not forgetting Team Manager, John Jenkins).